This is a superb novel. Rather, it is a superb inter-connected series of 6 novellas. Each of these concerns one of a series of reincarnations. Six people are separated by decades in time, but are each connected. They all have the same comet-shaped birthmark, and clues to an inter-connectedness between the five subjects permeates the book in the form of deja vu. Ironically, the only one of the five people who realises that there is a solid connection is Luisa Rey, a fictional character from a novel who quixotically takes the part of the middle incarnation of the six. Adam Ewing is a naïve 19th Century American who travels across the Pacific Ocean upon a ship named "The Prophetess"; an apt title for a human stage which sets the scene for the book. Ewing is initially exposed to stories of brutality and tyranny through the Pacific Islands, and then finds himself to be encompassed by the same level of tyranny and lawlessness aboard the ship. He falls victim to a corrupt doctor, narrowly escaping with his life (David Mitchell presumably had the mass-murderer Dr Harold Shipman in mind when he wrote this). The account is gritty and realistic, exposing the weakness and brutality of humanity, and how their trapped victims fall prey without mercy. Pre-war Belgium is the setting for the second journal, taking the form of a series of letters from a talented but vainglorious young composer, Robert Frobisher. His immoral and hedonistic urgings are hidden behind a façade of culture and learning. His initially fraudulent attempts to work with a distinguished but invalid composer bear fruit, giving the hope that Frobisher might achieve some kind of salvation through his art. However, he is let down by his pride, lust and ambition, and ultimately realises that he has bitten off more than he could chew, leading to ruin. The third character is fictional, and is set during a period of time that the fourth incarnation also lives through, namely the 1970s. Yet, her links to the past and the future seem stronger than the others, and she actually realises that she is the reincarnation of Robert Frobisher through reading the letters he had sent to his lover; a real-life character in the novel. Rey lives the part of an adventurous and ambitious journalist trying to break open the secrecy surrounding the safety issues of a nuclear reactor. She also finds herself out of her depth, as various characters fall foul of the murderous security officer. Yet, she wins through, indicating that the reincarnated soul is gradually evolving towards greater things. The fourth character is a vanity publisher in the present day who ends up reading the novel about Luisa Rey. Timothy Cavendish is a worldly-wise cynic whose cultured persona belie his business failings. He accidentally strikes it lucky when a client of his murders a book critic at a party, propelling the author into prison, and the book to the top of the bestseller chart. However, Cavendish is hunted down by the author's brothers and ends up taking refuge in a nursing home which, it turns out, treats him as a demented patient and incarcerates him within a regime as tyrannical as any other in the book. His wily efforts to escape are entertaining, to say the least. The fifth character is a genetically-modified human clone named Sonmi-451. She works for a Korean fast-food corporation set in the future. Essentially, she and all of the other clones are treated as slaves by a powerful corporate system which is manipulative and corrupt, even evil. Genetic engineering has altered the boundaries of morality within society. As the story unfolds it becomes clear that the world is fast disintegrating, and Sonmi-451 becomes a pivotal pawn in a grand end-game. Her incarnation has acquired the wisdom to keep her own counsel and trust no one, allowing her to inevitably deal a killer blow to a corrupt system which is manipulating her for its own ends. Lastly, the sixth character appears in an account given by a maverick Hawaiian islander during a future time following the complete collapse of civilisation. Fledgling tribal societies retain a myth of the civilisation that has fallen, and have become simple and free. However, in a tragic parallel with the accounts of tribal decimation in the first novella, the Valley peoples are brutally overcome and subjugated by another island tribe. History has repeated itself, but the reincarnated soul, in the form of a knowledgeable anthropologist from a distant civilised remnant of the old times, manages to escape the destruction to keep some hope alive that barbarism won't completely win the day. 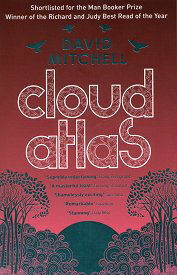 The structure of 'Cloud Atlas' is unusual. Each of the first five stories halts abruptly halfway through, reflecting the partial knowledge attained about that incarnation by the next one. As the novellas progress each incarnation finds the second half of the previous story, allowing each story to be finished in reverse chronological order in the second half of the book. Ingenious. The evolution of the individual over a number of lifetimes is counter-balanced by the disintegration of society towards tyranny, totalitarianism and eventual anarchy. It is a pessimistic worldview, reflecting our modern angst about where present-day society is heading. The individual's life purpose is to overcome tyranny and brutality, and thereby obtain wisdom and self-knowledge. David Mitchell doesn't hold back in his portrayal of human evil, which becomes the norm rather than the exception in his work. His observations are sharp witted, often painful, and well read. An immense amount of research has gone into the authorship of the book to provide its rugged realism. I can't recommend it highly enough.